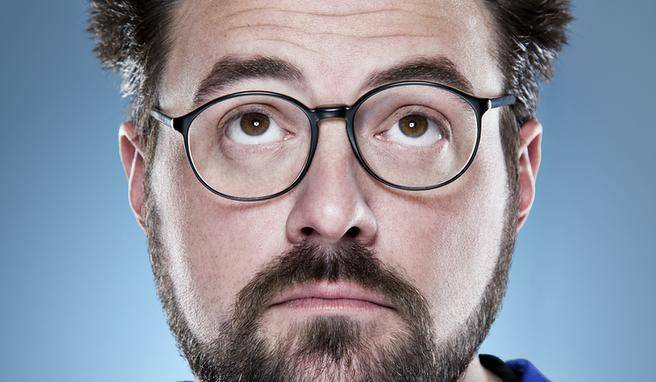 Once the slacker counter-part to Quentin Tarantino, both in his video store past and his leading role in the revolution of modern dialogue 20 years ago, Kevin Smith has spent the last few years trying to change his image, with varying degrees of success. Premise: Two NYPD partners (Willis and Morgan), assigned to track down a lost baseball card, find themselves up against a ruthless gangster, all the while “aided” by the lowlife who originally stole the card (Scott). Verdict: Cop Out is the only Kevin Smith movie he didn’t write, and it shows. The jokes are painfully bad, the plot has no momentum, the roles are miscast, and the characters are one-dimensional at best. As a hired gun, Smith is barely adequate, clearly not caring about characters and jokes that were never his. Without question, Cop Out‘s the weakest of Smith’s catalogue. Premise: Perennial slackers Jay and Silent Bob (Mewes and Smith) discover that a comic book based on them (as stoner superheroes “Bluntman and Chronic”) is being adapted into a movie, without them having been paid any royalties. They decide to take Hollywood by storm, poking fun at the whole industry (and Smith’s earlier films) along the way. Verdict: An all-star comedic cast to rival It’s a Mad, Mad, Mad, Mad World or The Grand Budapest Hotel, Jay and Silent Bob Strike Back unites actors from all four of Smith’s previous movies (as their respective, returning characters) while also adding a number of new faces like Ferrell and Scott. As a love letter to his fans, it’s hysterical. As a movie in its own right, its puerile humour wears thin very quickly. Ultimately, Jay and Silent Bob just aren’t strong enough characters to anchor an entire movie. Premise: Comic book aficionado Brodie (Jason Lee) and lovelorn TS (London) spend a day at the shopping mall in town, to get their minds off of both being dumped by their girlfriends that morning and to figure out a scheme to get them back. Verdict: After Smith’s paradigm-shifting Clerks. made audiences fall in love with slackers who spend a whole day just talking, Universal Pictures hired Smith to essentially do the same thing again, this time in a mall. Mallrats has its moments of comedic genius (particularly the excellently constructed game-show ending) and Jason Lee is fantastic in his debut, but the movie finds itself spinning its wheels repeatedly, struggling to stay interesting for its whole running time. Premise: Switching tones completely, Red State is a graphic thriller about an ultraconservative cult. Switching points-of-view between three abducted teenagers, the cult’s disturbed leader (Parks), and the ATF agent in charge of taking them down (Goodman). Verdict: Smith gets points for trying something new and not giving in to the compulsion to make Red State funny. He does an adequate job with things, although he doesn’t have the natural flair for horror that he does for comedy, despite his obvious fondness for it. Parks, on loan from Tarantino’s cadre, is excellent as the unpredictable and unreasonable Pastor Abin Cooper. Premise: After his wife dies in childbirth, publicist Olliver Trinké (Affleck) has a very public meltdown and gets fired. Rebuilding his life years later, he meets a video store clerk (Tyler) who helps him appreciate everything he still has and rebuild his life and image, along with his precocious, 7-year-old daughter (Castro). Verdict: Jersey Girl is much better than you heard (or remember). Coming out at the tail end of the “Bennifer” era and closely following Affleck and Lopez’s Gigli, it was lambasted less for it being bad than because people just were fed up with the couple. Judged on its own merits, Jersey Girl does get a little sentimental at times, but that maturity helps the movie stand out against Smith’s lower-brow comedies and showed a growth that could have flourished if audiences had been willing to appreciate the film for what it was. Premise: Best friends and housemates Zack (Rogen) and Miri (Banks) are broke and soon to be homeless, until they run into a friend at a high school reunion who’s living the life, as an adult film actor. Zack and Miri decide to make their own movie to raise the money to keep their apartment, only to find latent feelings for each other emerging. Verdict: Borrowing his cast from Judd Apatow (the Kevin Smith of the ‘00s, if you will), Smith’s eighth feature had a fresh look, a sharp premise, and interesting characters, elevating it above its controversial title. Rogen and Banks give two of their best performances as Zack and Miri and the script cleverly walks a line that allows the movie to function both as a touching dramedy of friends falling in love and a ribald comedy about amateur pornographers. Plot: A decade after the single-day events of Clerks., bantering friends Dante (O’Halloran) and Randal (Anderson) are working not at their old convenience and video store jobs, but at a fast food counter, struggling to grasp what happened to their twenties and early thirties. Despite being newly engaged, Dante also finds himself attracted to his boss and close friend, Becky (Dawson). Verdict: Making a sequel to the critical darling and sleeper hit Clerks. seemed a foolish idea when it was first announced, but Smith somehow found a way to maintain the world of Dante and Randal ten years later, despite the much larger budget and insertion of the recognisable Dawson into the picture. It’s just as funny as the first movie, albeit sometimes in different ways, and the chemistry between O’Halloran and Anderson is even better this time around. Clerks II is one of Smith’s funniest movies but also one of his most emotionally satisfying, plumping mature depths with the characters and leaving itself a perfect companion to his debut 12 years earlier. Plot: Holden McNeil (Affleck) is a comic book artist who works alongside his best friend, Banky (Lee). When Holden meets Alyssa (Adams), another comic artist, her effervescent and outgoing personality leaves him head over heels – which becomes an issue upon his discovery that Alyssa is a lesbian. Verdict: Perhaps the biggest gamble of Smith’s career, what could have been an insulting or simpleminded misstep is instead an incredibly rich drama, a complex love story, and a master’s class in acting. Affleck gives one of his best performances as Holden and Adams and Lee match him scene for scene. Smith’s screenplay for Chasing Amy is one of the most adult things Smith has written and the dramatic moments land with perfect grace and power. Plot: Bethany Sloane (Fiorentino) is stuck in a rut in life, finding no value in work, religion, or relationships, until she’s visited by Metatron (Rickman) and tasked with a holy crusade: stop the fallen angels Loki (Damon) and Bartleby (Affleck) from re-entering Heaven through a new church loophole and thus prevent the end of existence. Verdict: One of the most intelligent comedies of the last quarter-century, Dogma is a masterpiece of writing, acting, comic timing, philosophy, and theology. It functions as a straightforward comedy, if that’s all you’re looking for, but underneath the dumb jokes and foul language is a brilliant examination of religion’s role in the modern world. It’s a wonderfully thought-provoking look at spirituality, regardless of where your own personal beliefs may lie, and powerfully does two things all great movies should do: raise interesting questions and create provocative discussions. Plot: Twenty-something Dante Hicks (O’Halloran) shows up at the convenience store he works at to cover someone’s opening shift, only to discover that he’s stuck working the whole day, on what should’ve been his day off. But at least he’s joined by his best friend, Randal Graves, who “works” at the video store next door. Over the course of a 12-hour day, Dante and Randal deal with girlfriend trouble, “the ones that got away,” rooftop hockey, an ex’s wake, and civilian casualties on the Death Star. Verdict: While influenced by Richard Linklater’s Slacker and similar to Tarantino’s conversations about nothing in Reservoir Dogs, Kevin Smith’s dialogue in Clerks. was the most realistic in any movie made prior to 1994, really. Like a Gen-X David Mamet, Smith’s ear for natural dialogue is uncannily in tune, leading to conversations more narratively gripping than any explosion or chase scene. Told over the course of a single day, shot in a grainy black-and-white that at times gives the movie a security camera feel, and unabashedly vulgar (as any realistic movie about guys in their 20s should be), Clerks. was a revelation in 1994 and feels just as fresh today. The soundtrack may date the movie a little and one or two references may not make sense to twenty-somethings today, but Clerks. is a timeless piece of cinema that stands not just as a paradigm shift for modern cinema but also simply as a outright hilarious movie.